I got home very late Friday night from two full days plus of engaging with talented, knowledgeable, experienced, and giving people that make up the NESEA community. 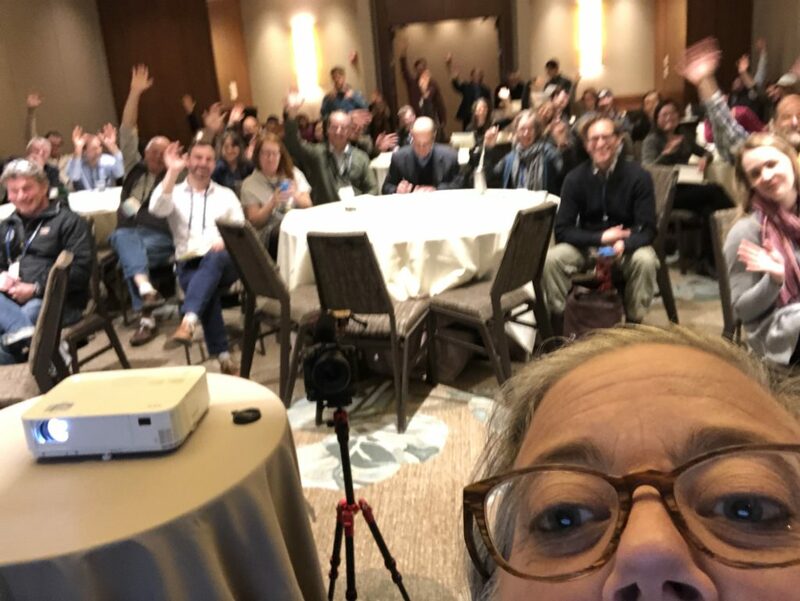 The Building Energy conference does just that for me and for thousands of others, and I want to share a bit of what I learned to build your energy and capacity for better work and our better future. The Keynote – focused on carbon sinks, and our need to really understand not only operational energy use and GHG emissions, but the CO2 equivalent numbers for the materials we use in our buildings. It is astounding to learn that we can vastly improve our buildings construction now from materials readily available at Home Depot . 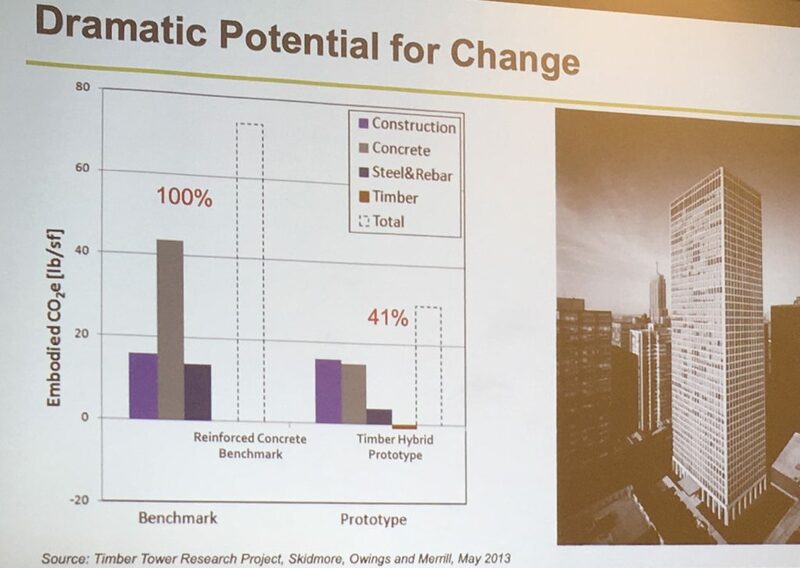 Moving to wood, avoiding GWB (gypsum wallboard) and doing all we can to reduce the yards of concrete we use as well as the % of Portland cement in it each makes a huge difference. 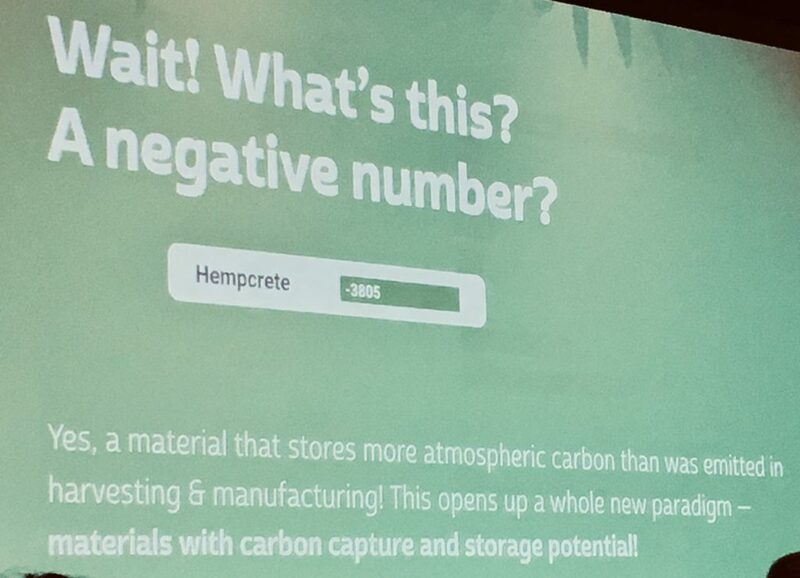 A negative number means our material choice is sequestering MORE carbon. When we can rely more on grown materials, a couple of things happen. We sequester CO2 because we trap that existing captured CO2 in stasis in the materials we use and protect from degradation in our buildings. We improve our relationship to farm and farm work by building cycles of use that are managed, and these cycles need skills and planning. We improve soil because the uptake of carbon exists not only in the trees and grasses that we use, but in the extensive root systems that remain behind and decompose to enrich the soils. We begin to rely on local products because of the better relationships. Start paying attention to your materials in ways that inform beyond % of recycled content. 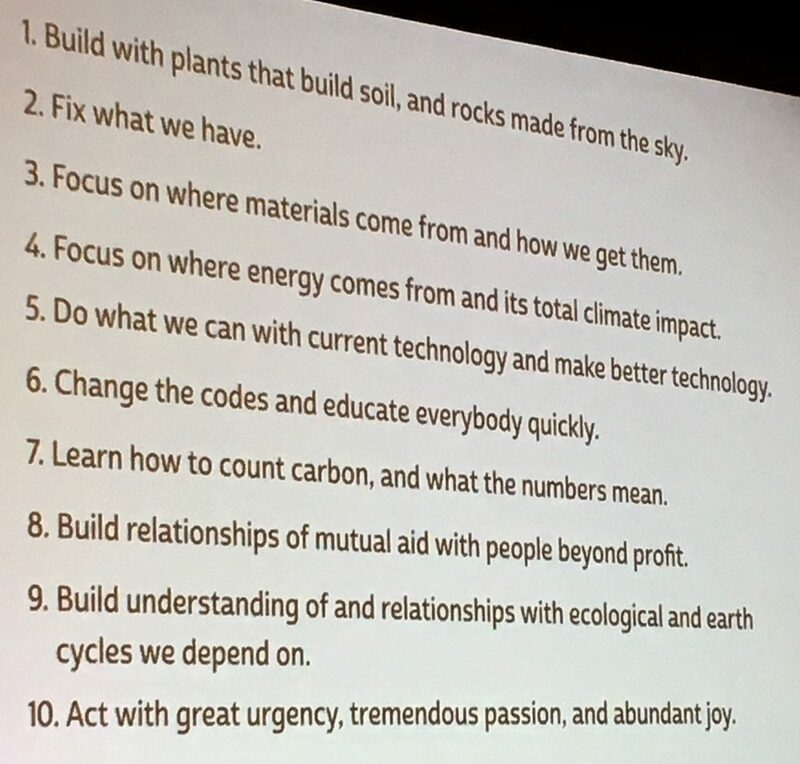 Social commentary – this keynote was about inclusion of the entirety of the cycles of our buildings related to the natural systems we live within. And this session was delivered by folks from New Frameworks (worker-owned) and from Endeavor Center (education w/hands-on experience). I cannot think of a more illustrative expression of the keynote content than the way these folks do business. 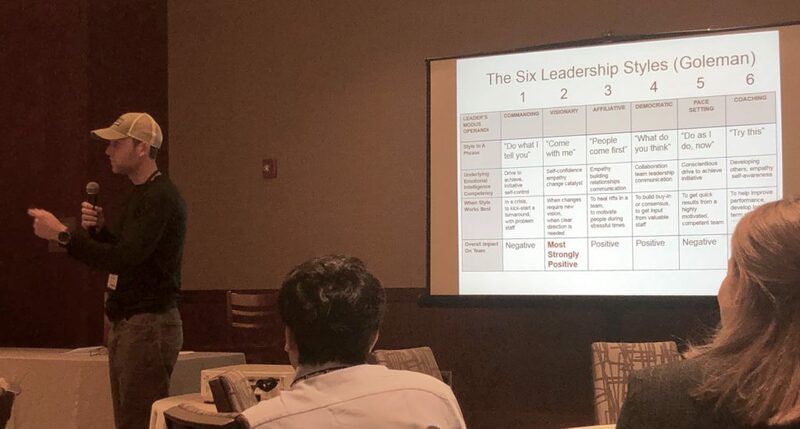 Leadership – I then attended a session on building leadership effectiveness, a session that highlighted the synergies between our innate personalities and abilities and the styles of leadership that are most common. The imperative for success is to know your own strengths and weaknesses, to understand the situation of the moment (panic needs different leadership than daily encouragement does), and the effectiveness of different leadership styles. All in a melange of interaction. If you want to know more, the session was crafted by Barbra Batshalom of the Sustainable Performance Institute. Social Commentary – the most effective aspects of this session were the hands-on exercises that threw in a bit of improv. People learn faster with “play” and this gave us that sense of fun, while allowing us to experience the variety of approaches. It also built the community in the room as we cheered each performer on. Improv – What type of leader are you? Resilience – Just after lunch (which was exceptional. by the way) I attended a session discussing the resilience offered by high-high-performing envelopes and back-up power. There is a set of pilot credits in LEED related to resilience, and it has been challenging for teams to achieve success in producing a health-care building, for example, that can perform to the levels required, in the winter, when the elimination of power means the ventilation is not running. 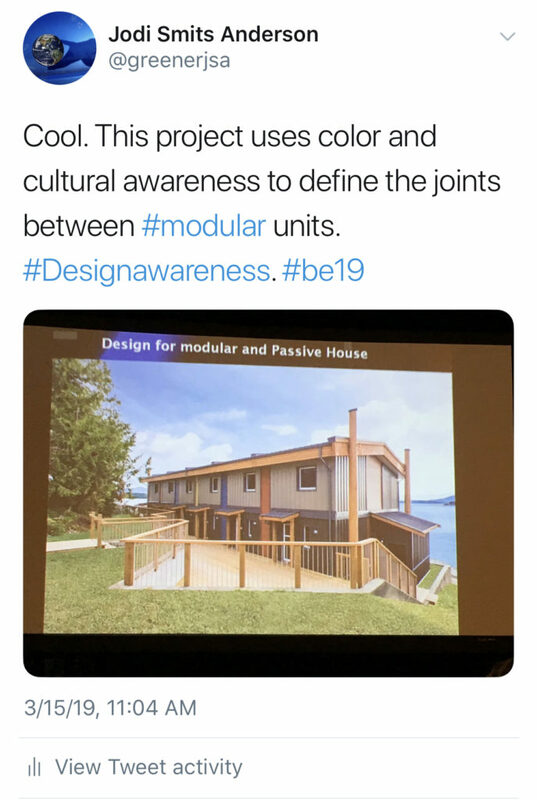 Imaging a patient wing that is passive house certified, with ample views, and ability to naturally ventilate quite well in summer and shoulder seasons, but that is located in a region with freezing winters. Even if the envelope can help the wing maintain thermal comfort, how do we ventilate and retain the temperature levels with no power? We can only open the windows and then we lose all thermal retention. This is a fascinating issue and one we need to understand and then seek to solve. My thought? ERV units with integral battery back-up. These would provide just enough to lengthen the shelter-in-place capability of such a building for a few needed days. Social Commentary – what was revealed to me in this session is that resilience is not the same for all people, and that we don’t talk about resilience in the right way. Building to Passive House standards and providing on-site renewables with working transfer switches (of use even when power goes out) and designing to amplify the safety-in-place during outages can cost more, certainly. And what is the cost of moving ill, aged, or recovering populations when the power dies? 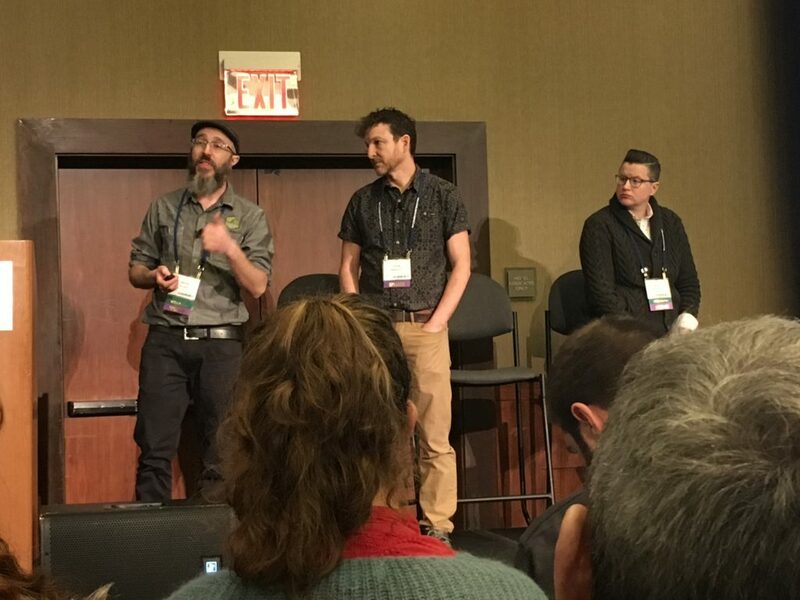 Biophilia – I spoke late in the day about Biophilia and how we know how to do this work, as evidenced by all the biophilic content in our most popular and loved buildings, historic and contemporary. Suffice it to say, my main message is that we are one with nature and in connecting with nature we benefit ourselves and nature’s systems. This level of attachment, connection, and awareness can only improve our abilities to design well and within the limits of the systems upon which we rely. My awkward selfie at the start of my session. Social Commentary – I had a great discussion with Marc Rosenbaum of South Mountain Company post-session, and he brought up the word “deliberate”. Or was it “intentional”? Anyway, either makes an excellent point. When it comes to diversity, biophilia, energy efficiency, integrative process and more, we often know how to do things, and why to do things. The need is to recognize this and to be deliberate in our actions. This sounds like a theme to me for many future discussions…I seek to infuse my work, my life, with intentionality. Friday started off for me with some amazing conversations at the Lifetime Member breakfast; Meeting fellow travelers and finding out from them their questions, their pursuits, and their discoveries. I get this level of gracious sharing and welcoming companionship nowhere else as deeply as I do at NESEA conferences. It grounds the info in reality, even when the case studies or insights are theoretical in nature. And it is all honest, curious and thoughtful sharing. Timber – An early morning session on timber framing including info on CLT and other forms of mass timber. Mass timber is different from heavy timber in that it is built up of smaller sections. Mass timber can be used in all five main construction types, and it absolutely and dramatically reduces embodied CO2e in comparison to steel or concrete. There are benefits in speed of on-site assembly/construction but necessary investment of time in planning and pre-manufacture of components. This was a wonderful session, culminating in an SOM data-example assessing the CO2e of an existing high-rise against the same high-rise done with mass timber. Social commentary – mass timber accomplishes a lot. It reduces our embodied carbon. It tends to push us to local resources and forest management. Most important to me is that it is creating more opportunities for biophilic connections that will help us remember we are one with nature. Building Science and Panelized systems – And then onto a classic presentation by John Straube whole we all know and love as a pull-no-punches presenter, with vast experience in data and building science. NESEA is one of the only places I can alway count on finding data geeks with presentation skills. And I thank them for that. Here are a couple of takeaways: “Must accommodate dimensional tolerances.” “Be pragmatic, not dogmatic regarding panelized construction.” “Protect against rain (always).” “Joints – a technical term for a very long hole”. Social commentary: healthy cynicism can comfortably go hand-in-hand with hope, humor, knowledge, and joy. Large Scale Passive House – and what’s working was also well worth the time and attention. We had to pay attention because the speed of information flow was double that of any other session I attended. Clear and direct, and FAST! Some key points to the projects were the assessment in the modeling of the ERVs, when they would struggle to meet the parameters of performance, and how to address this. The selected solution was to provide two large ERVS to blend air between the many living units while ventilating, as some were way too high humidity wise (occupancy diversity) and some low. This helped shave the peaks. Also to allow bypass and intake of external air for some period of highest internal load (winter, at common shower and cooking times) to dry out the air a bit more. This is a small energy hit, as more outside air needs to be tempered, but it means a less expensive and better operating system overall, while providing ERV MOST of the time. Social commentary – the featured projects were both residence buildings, but one for student housing and one for affordable. These situations have different load parameters, and therefore a variety of approaches that would perform well. We are building buildings for people, people! How Big is Small – was a whirlwind of insights, giving us perspectives from six or seven different practitioners about small homes, co-housing, love of the spaces you create and live in, and data frustrations (what is our measure of square feet and what does it really mean?). There were a few great (truly great) things about this session. A continuing exchange of ideas on one theme. The quotes from each presenter that ushered them onto the stage. The understanding that “if it is too small, it is wasted space”. Social commentary – I am so glad I ended with this session. It represented to me the diverse community of which I am a part, and gave me a deeper picture of a few people who I have met in the past, but do not know. I think this is one of the greatest aspects of any well-done conference. You begin to understand there are many solutions, much to learn, and hundreds to learn from. A final reflection on this NESEA society. NESEA is actively balancing very well to be unique and supportive of our current family, and still open to greater inclusion. There was a lunchtime gathering to explore diversity and I loved how this meet-up was introduced. Open to people of color, indigenous people, queer, trans and gender non-binary individuals (LGBTQIA), women, and people with disabilities in the larger community. The verbal invitation was made in a totally welcoming way while being clear that this focus group needed this opportunity to share stories and experiences on their own. This interaction and focus was to support being healthy people that will be valuable contributors to the greater NESEA community and the full green building industry. It is an interesting irony that sometimes openness requires focus and energy on a smaller group, or on a particular concern. 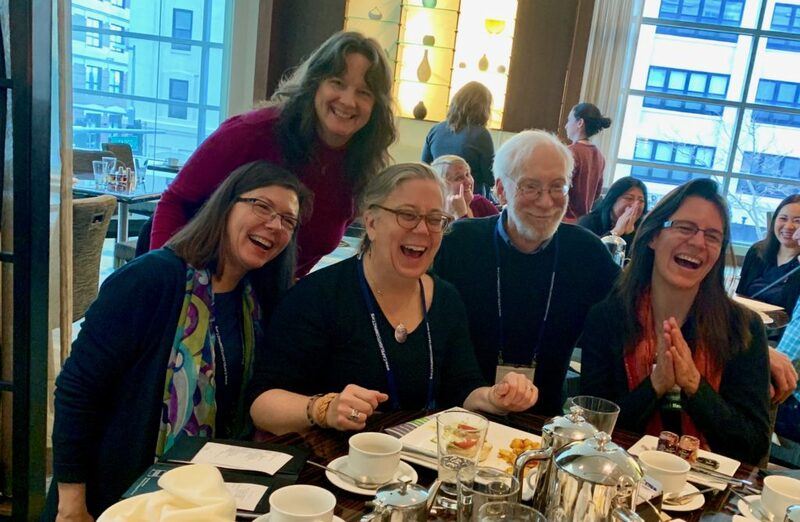 It is a testament to NESEA as an organization that they see this, and support such a beautiful and diverse community in how we do work, who we are, how we learn, what we eat, where we are in learning, and how we attend the conference. And a testament to the quality of the people associated with NESEA that they so completely understand that diversity brings us resilience and strength, along with the capability to thrive. This is building our energy (and mine). Thank you.